for contributions of code, conversation, and general neighborliness. As I was recently reminded that the Crossbow Telos B and Sentilla TMote Sky devices litter most universities, left over from wireless sensor network research, it seemed like a perfect target. As such, I'm happy to announce that the GoodFET firmware now fully supports the Telos B and TMote, and also that support for the Zolertia Z1 mote will be coming soon. KillerBee integration should come in the next few weeks, but there's plenty of fun to be had in the meantime. This brief tutorial will walk you through cross-compiling the GoodFET firmware for the Telos B or TMote Sky, as well as simple packet sniffing and injection. As the GoodFET project is always being refactored in one way or another, you can expect a bit of this to change. A port of the GoodFET firmware is defined by three things. First, the $platform environment variable defines the header file from which port definitions come. Most platforms just use platforms/goodfet.h, which is loaded when $platform is undefined or set to 'goodfet'. Some devices, such as the two varieties of the Next Hope Badge and the Telos B, use ports which are not the same as the standard GoodFET's layout. In particular, it's rather common for the Slave-Select (!SS) line to be unique to the hardware layout of a particular board. Setting $platform to 'telosb' takes care of this. Finally, a normal GoodFET includes a lot of modules for things like JTAG and similar protocols that the Telos B does not include wiring for. Although leaving them in doesn't hurt, it does make the firmware larger, which is annoying when repeatedly recompiling and reflashing during firmware development. To restrict support to just the monitor, the SPI Flash chip, and the Chipcon SPI radio, it is handy to set $config to 'monitor spi ccspi'. The Telos B is reset in a manner very different from the GoodFET, courtesy of a bit-banged I2C controller. Someday we'll figure out how to auto-detect this, but until then you will need to have $platform set to 'telosb' just as you did when compiling. The Telos B contains a Numonyx M25P80 SPI Flash chip, which is compatible with the goodfet.spiflash client. Unfortunately, most units use a variety of this chip that does not respond to a request for its model number. (According to the datasheet, this feature is only available in the 110nm version. Datasheets have a way of phrasing bugs as if they were just optional features.) On those lucky units with a properly behaving chip, run 'goodfet.spiflash info' to get its capacity and model number. Upgrading to a larger chip or replacing the SMD unit with a socketed one will cause no problems, as the client will automatically adapt. You may also use the standard peek, erase, dump, and flash verbs to access the contents of the chip. When the chip refuses to identify itself, the GoodFET will default to a size of 8Mb, so explicit ranges needed be given for things like 'goodfet.spiflash dump telosb_m25p80.bin'. As the M25P80 chip is not access-controlled in any way, it's a handy way to grab old data from a node. On some academically-sourced devices, you might find leftover data or code from LogStorage or Deluge. On commercial devices, these chips sometimes keep hold more interesting things. While the Flash chip is a neat little toy and handy for forensics, most users of the Telos B port will be interested in the CC2420 radio. As a final collaboration between Ember and Chipcon, the '2420 was one of the first popular 802.15.4 chips, and it is still quite handy for reversing and exploit ZigBee devices. Just as before, you must set $platform to be 'telosb' or the client will not connect. To sniff raw 802.15.4 packets on channel 11, just call 'goodfet.ccspi sniff 11'. This enables promiscuous mode, so you will see traffic from all PANs and to all MACs in the region. 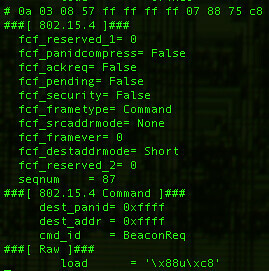 If you are only interested in broadcast traffic, use 'goodfet.ccspi bsniff 11' instead. As much fun as it is to sit with the 802.15.4 and ZigBee protocol documentation to figure out what a packet means the first time, white-washing this particular fence quickly becomes boring. For that reason, Ryan Speers and Ricky Melgares at Dartmouth tossed together a Scapy module for dissecting these sorts of packets. It's in the scappy-com Mercurial repository, so check it out with "hg clone http://hg.secdev.org/scapy-com" then run "sudo python setup.py install" after the prerequisite packages have been installed. If you have no other 15.4 equipment to play with, you can do a transmission test with 'goodfet.ccspi txtest 11'. In the following section, I'll show you to how to send and receive packets in a Python script, which is useful for talking to the myriad of wireless sensors that have less than serious security. The GoodFET project is built as a number of client scripts which are written in spaghetti code, features from which are slowly moved out of spaghetti and into classes. That is to say, the heavy lifting should be in GoodFETCCSPI.py, while short and sweet client scripts will be found in goodfet.ccspi. As an example, this section will cover the functioning of 'goodfet.ccspi txtoscount' which implements the radio protocol spoken by the TinyOS RadioCountToLeds application. Rather than go into too much detail, I'll just point out the lines that are most instructive. Just like sing-along cartoons, this only works if you read the code, so please open up your favorite editor and follow along. While you're at it, use 'svn blame' to figure out which new GoodFET developer wrote that routine. If too much time has passed, you'll also need to back up to the revision that was current when I wrote this review. Then jump back a few more revisions to figure out which bugs of mine had to be fixed before his code worked. Isn't revision control nifty? By default, the CC2420 only receives packets addressed to the local PAN and MAC as well as those sent to the broadcast address. In order to receive promiscuously, allowing the client to automatically identify any devices on the channel, it is necessary to enable promiscuous mode with 'client.RF_promiscuity(1)'. You might also want to tune away from the default channel with 'client.RF_setchan()'. Packet reception, as is standard among the radio modules, is performed by 'client.RF_rxpacket()'. This method returns None if no packet has been received, so a synchronous application ought to spin in a loop until something else is returned. Finally, the routine needs to broadcast its own reply, either from a stock template or from the sniffed packet. This is accomplished by passing an array of bytes to 'client.RF_txpacket(packet)'. The GoodFET is primarily a tool for reverse engineering, and integration with other tools is a priority. KillerBee and Kismet plugins are already in development, and clients for all sorts of 802.15.4 devices will be written as hardware becomes available. Support for the CC2420's AES engine will also be added, so that encrypted packets can be sniffed once keys are sniffed from the air or by syringe with a bus analyzer. That's all folks. Grab a Telos B or TMote and start poking at devices. Good targets might include Z-Wave door locks and ZigBee thermostats. With the new build system, don't bother defining $config, $platform, or $mcu. Also, I mistakenly thought that ZWave was a form of Zigbee. It's not, but you can sniff it with a GirlTech IMME's CC1110 radio. Hi, Nice project. Can you please tell me where can I download the TelosB codes of this project? Did you know that you can create short links with Shortest and get cash from every visit to your short urls.